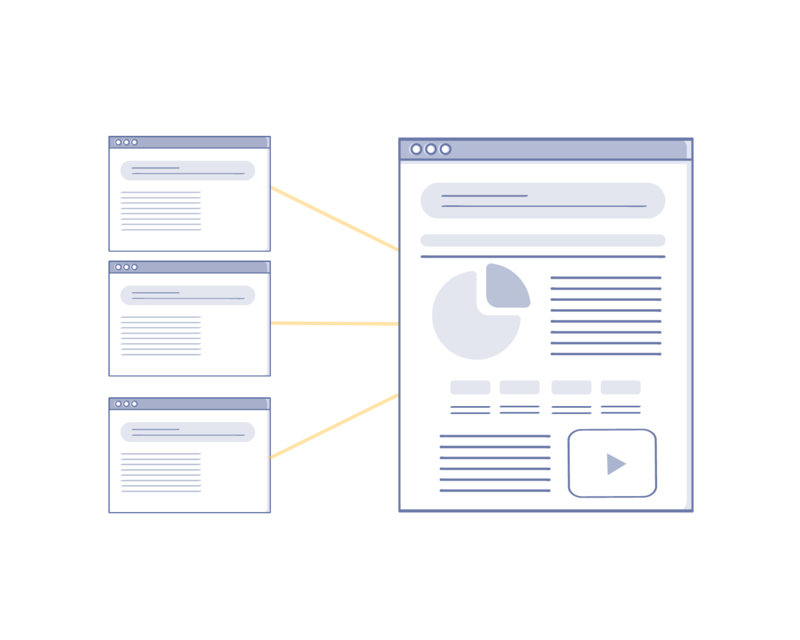 Consolidating content can provide a single authoritative resource about a subject by combining and updating pre-existing content from your web site. Hire us to help you consolidate your website copy. The combination of several articles or blogposts into one long form piece of content resulting in a better, more authoritative resource on a subject. What are the benefits of consolidating content? We will use the example of a company that sells bicycles, but the example could be a bank, a software company, or anything else. Here are some types of content that a bicycle company has produced. They have pages that talk about their bike models, they have instructional articles for the use of their bikes, they have fun blog posts and they have general maintenance articles about their products. These articles and many more exist currently on their site. They do a content inventory and they find out they have many articles that talk about brakes. None of these articles actually rank in Google for “brakes”, they just are small articles that somehow speak about brakes. A great content inventory can provide great information not only on the subjects of your content, but also on their performance in Google. Let’s look at the benefits of consolidating content from a traffic and rankings stand point. 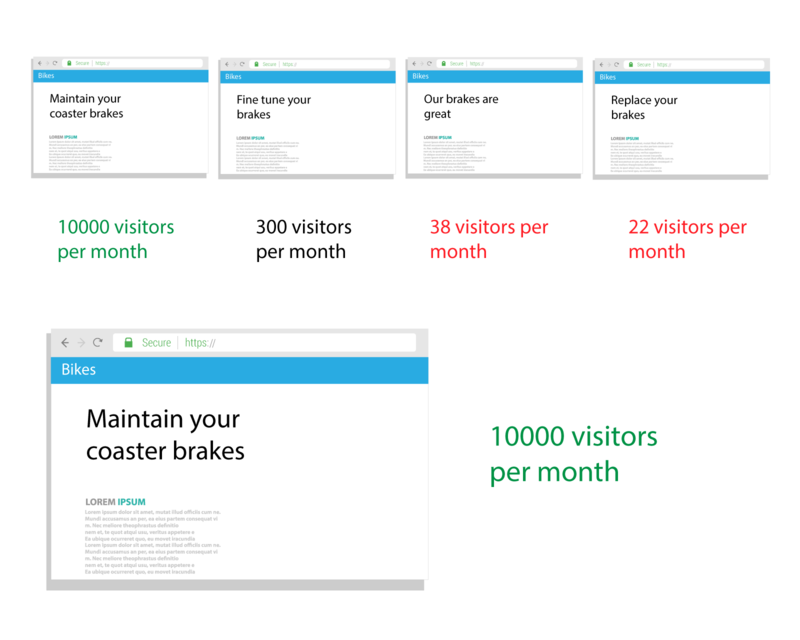 The bicycle company looked at how well all of their “coaster brake” articles were performing in Google. They discovered one article was performing much better than the rest. Knowing this, they can make some decisions about URLs, the subject matter, and redirection. In the above example, the article that is performing the best, is about maintaining your coaster brakes. It seems that people are using this article and Google is ranking this article better than others. 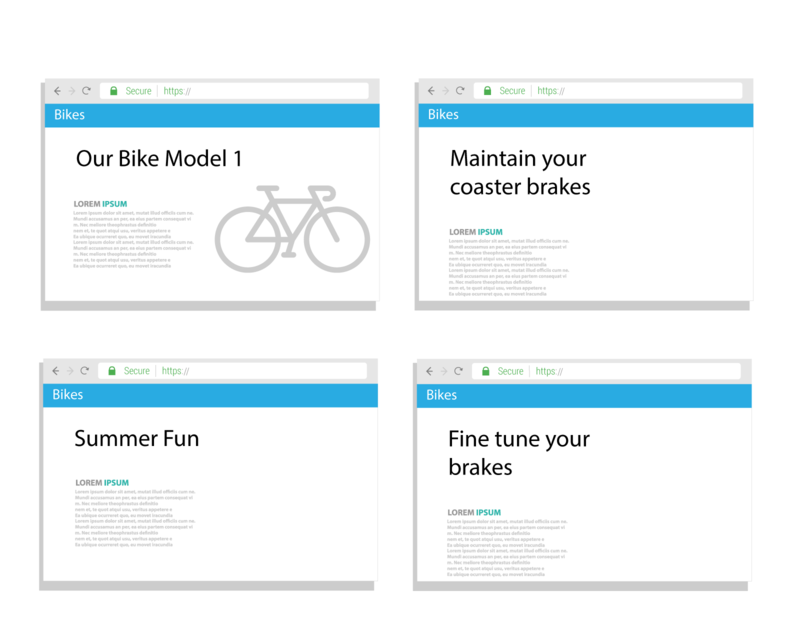 If the main thing people and Google likes about “coaster brakes” is maintenance, then our new resource should by all means have a great maintenance section to it. This type of research can limit costs by recognizing where attention should be placed as far as new image content is concerned or new copy. If I owned this bike company, I would likely make a great new graphic about coaster brake maintenance and also add extra copy to that subject when consolidating my old content. I would do so because that is what my content inventory and my research told me would have the greatest impact. Using our SEO specialists, I would make decisions about about where this new resource would be on my website (what URL is would have). In some cases it might be smart to use the URL of my top performing article on the subject, in other cases it might be smart to create a new URL that really is simple and clear (example: “https://example.com/coaster-brakes”) and then redirect my other articles to the new resource. Working with their SEO content specialist the company decides that they want to write an authoritative resource about brakes that will actually rank in Google for “coaster brakes”. Using those pre existing articles, maintenance copy, and images they already own, they start to create an amazing resource about “coaster brakes”. This new resource is a valuable resource which explains a subject with authority. That subject is topical because it is feature of the main product they sell. The cost to create the content was low as they used existing content from their site. After you have the new resource and have decided what URL it will have, you can begin redirecting the other articles to the new one. These redirected articles will not just send more traffic to your new article, they will also transfer whatever “value” those previous articles had with Google. That means that the combination of the great new content and the redirect value from the other articles will work together to help your resource rank well. 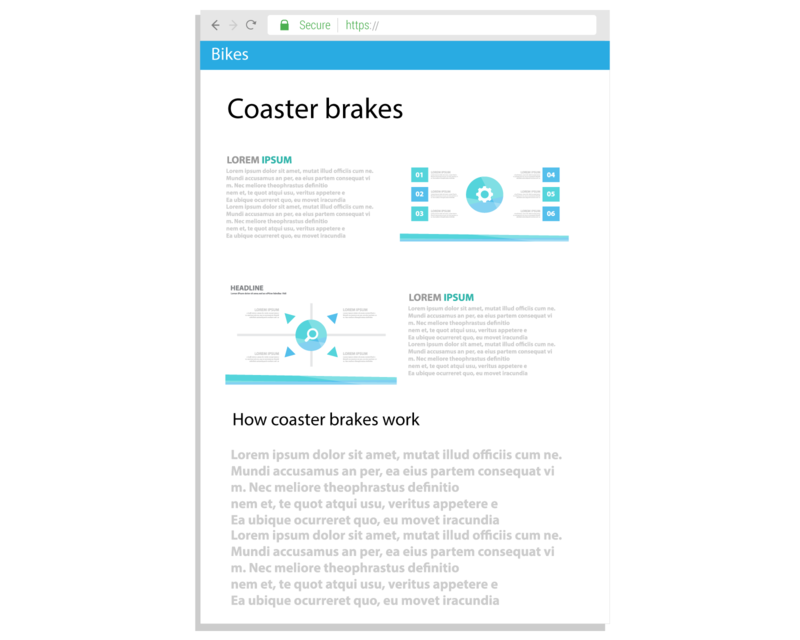 In the case of the bicycle company, their new resource is now ranking for “coaster brake”, They are receiving more traffic to their website and exposing their brand to more people. Now that they rank for “coaster brake” they realize with joy that there are so many other bike parts they can do this with. They can do “handlebars”, “seats”, “frames”, etc. and they happily march toward search engine dominance by creating great resources. That mindset of creating small quick articles about subjects that your company wants to rank for or that would be of interest to your customers often came at the expense of creating true and authoritative content. Many companies have hundreds of articles about a subject from different angles that have already been created. Most of these articles are ranking or bringing traffic. Even the ones that are bringing traffic are not bringing the traffic in the same amounts. From a company stand point all these articles served a purpose, have been paid for and are live on your site. If you have already covered a subject from several different angles, have already paid for the content and already own these assets then why wouldn’t you want to combine all these into an authoritative piece of content that can gain your website traffic and improve your rankings? Need help consolidating your website copy? We’re here to help. Contact us here to get started.